David is enjoying returning to study and is looking forward to the challenge of clinical years. Australia is faced with an ageing population and is bracing for the significant health challenges of this changing demographic. Individuals born during the post-war population boom of the late 1940s are now progressing into the over 65 age bracket, which has led to the emergence of a number of unique health and economic challenges. While the majority of older adult Australians continue to live at home, caring for the ageing population will inevitably require additional healthcare resources. The full challenge of the ageing population will be faced by today’s generation of medical students. The future health system will not simply need to deliver more of the same services, but do so in a more efficient manner, making use of the most advanced technologies in a cost and time-efficient manner. The system will need to adapt to the complex needs of the elderly patient, optimising coordinated care between primary and tertiary health care facilities. Currently, within the population of Australia some 15% (3.1 million) are affected by arthritis, with osteoarthritis being the leading cause. Being a degenerative condition, the incidence of osteoarthritis increases with age, and accounts for the primary cause of approximately 97% of total knee arthroplasties (TKAs) performed in Australia. The dramatic increase in the population aged over 65 represents an immense increase in the numbers of individuals at risk of osteoarthritic knee changes. Given the inevitable wave in those requiring joint arthroplasty, are we fully prepared for this expected number? In 2011, a total of 40,470 TKAs were performed in Australia. This represents an increase of 5.7% on the previous year and a further increase of 83.7% since 2003. There is also a growing trend of patients requiring TKAs at an earlier age, further adding to the workload of surgeons and hospitals. Given the growing demand and expected increase in the patient population, there is a clear impetus to evaluate novel surgical approaches used in total knee arthroplasties. By finalising operative procedures prior to surgery, there is less demand for intra-operative decision making by the surgeon, further streamlining the process. The individualised planning allows finalisation of prosthesis size, position and alignment prior to the first incision being made. While this process may require additional out-of-operating commitments by the surgeon, overall it may lead to a reduction in the total theatre time per patient. Of particular interest to both surgeons and hospitals is the proposed reduction in surgical time offered by PSTKA. Research conducted by Hamilton et al. (2013) compared intra-operative time of 52 patients undergoing PSTKA, and those undergoing conventional methods. That study demonstrated no reduction in surgical time offered by those receiving PSTKA. Of interest, the study noted the fact that the surgeon who performed all 52 of the cases had vast experience using conventional methods prior to the study. This included performing over 1,500 conventional TKAs compared to 20 PSKTA. With this significant limitation in mind, there is clear impetus for further evaluation into the possible time efficacy of PSTKA when performed by surgeons equally skilled in both techniques. In further research assessing the time efficacy of PSTKA, Nunley et al. (2012) reported a positive trend in reducing tourniquet time from 61.0 ± 15.0 minutes in the conventional group, compared to 56.2 ± 15.1 minutes in the PSTKA group (p=0.09). Alternately, another recent study demonstrated a significant reduction in total operating theatre time from 137.2 ± 33.6 in the conventional group, compared to 125.1± 22.7 in the PSTKA group (p=0.028). While some of these results are not statistically significant, they highlight the need for continued evaluation of PSTKA compared to alternative methods of TKA. Evaluation of the current research reveals an optimistic view of PSTKA in its ability to reduce intra-operative time. With any new approach to surgery, practice is needed to hone the skills essential for efficiency. As in any new area of research, there is a particular need for larger trials with extended follow-up. The purpose of this article is not to condone the widespread use of PSTKA, but rather to illustrate the importance of technology and the continued search for improvement. As doctors, it is essential to always question current methods of practice and seek to refine technique, finding improvements where possible. PSTKA makes use of some of the most advanced imaging and engineering techniques currently available, and provides an innovative approach to knee surgery. There is no doubt PSTKA offers an exciting alternative to conventional surgical methods, meshing surgical expertise with advanced engineering technologies. In the future, could the 3D printing of patient specific prostheses take this technology to the next level? Associate Professor Nigel Hope (MBBS, PhD, FRACS, FAOrthA) for continued encouragement and sparking an interest in Orthopaedic research. Australian Institute of Health and Welfare 2010. Australia’s health 2010. Australia’s health series no. 12. P1-523. Canberra: AIHW. Australian Government. Australia to 2050: future challenges. Canberra: 2010 Feb p1-22. Ryan P, Miller S, Cashman K, Lui YL, Tyman S. Hip and Knee Arthroplasty Annual Report. 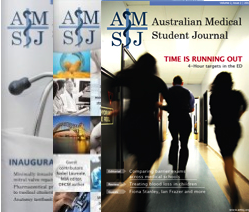 Australian Orthopaedic Association Joint replacement registry 2012, p120-124. Nam D, Mc Arthur BA, Cross MB Mayman DJ, Haas SB. Patient-specific instrumentation in total knee arthroplasty: a review. J Knee Surg. 2012 Jul;25(3):213-9. Spencer BA, Mont MA, McGrath MS, Boyd B, Mitrick MF. Initial experience with custom-fit total knee replacement: intra-operative events and long-leg coronal alignment. Int Orthop. 2009 Dec;33(6):1571-5. Nunley RM, Ellison BS, Ruh EL, Williams BM, Foreman K, Ford AD, Barrack RL. 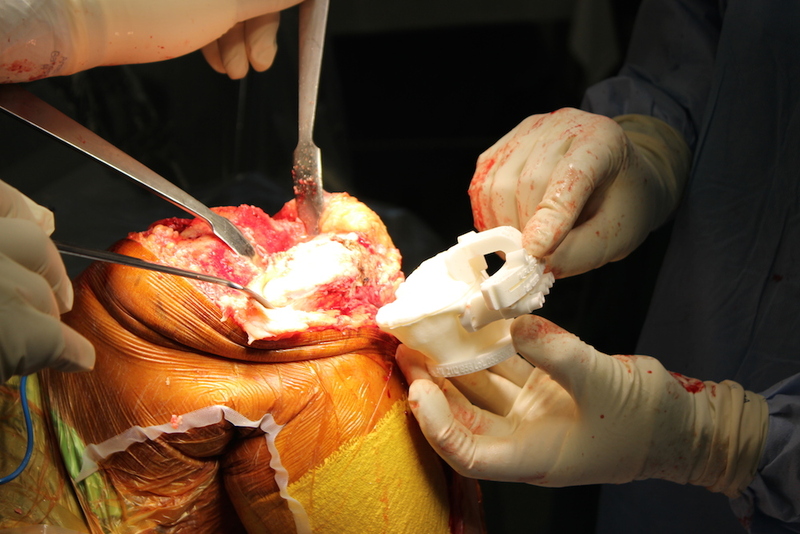 Are patient-specific cutting blocks cost-effective for total knee arthroplasty? Clin Orthop Relat Res. 2012 Mar;470(3):889-94. D. White K. L. Chelule B. B. Seedhom .Accuracy of MRI vs CT imaging with particular reference to patient specific templates for total knee replacement surgery. Int J Med Robotics Comput Assist Surg 2008; 4: 224–231. Harrysson OL, Hosni YA, Nayfeh JF. Custom-designed orthopedic implants evaluated using finite element analysis of patient-specific computed tomography data: femoral-component case study. BMC Musculoskelet Disord. 2007 Sep 13;8:91. Boonen B, Schotanus MG, Kort NP. Preliminary experience with the patient-specific templating total knee arthroplasty. Acta Orthop. 2012 Aug;83(4):387-93. Berend ME, Ritter MA, Meding JB,Faris PM, Keating EM, Redelman R, Faris GW, Davis KE. Tibial component failure mechanisms in total knee arthroplasty. Clin Orthop Relat Res 2004;428(428):26-34. Ng VY, DeClaire JH, Berend KR, Gulick BC, Lombardi AV Jr. Improved accuracy of alignment with patient-specific positioning guides compared with manual instrumentation in TKA. Clin Orthop Relat Res. 2012 Jan;470(1):99-107. Canale ST, Beaty JH. Campbell’s operative orthopaedics. Vol One. Elventh ed. Philadelphia, PA: Elsevier Inc; 2008. ]13] Watters TS, Mather RC III, Browne JA, Berend KR, Lombardi AV Jr, Bolognesi MP. Analysis of procedure related cost and proposed benefits of using patient –specific approach in total knee arthroplasty. J Surg Orthop Adv 2011;20(2). Hamilton WG, Parks NL, Saxena A. Patient-Specific Instrumentation Does Not Shorten Surgical Time: A Prospective, Randomized Trial. J Arthroplasty. 2013 Aug;(13)00480-4. Mont MA, McElroy MJ, Johnson AJ, Pivec R; Single-Use Multicenter Trial Group Writing Group. Single-use instruments, cutting blocks, and trials increase efficiency in the operating room during total knee arthroplasty: a prospective comparison of navigated and non-navigated cases.J Arthroplasty. 2013 Aug;28(7):1135-40.